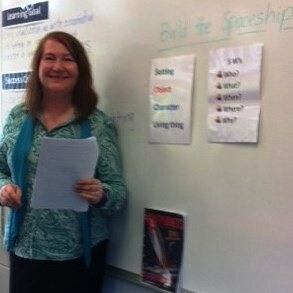 I presented ‘Build the Spaceship‘ creative writing lesson, using visualization techniques to create a movie-like story with a setting and a viewpoint character. The kids loved it especially when I called ACTION and the story came to life!!! I couldn’t believe the enthusiasm shown by the students and the positive feedback I received from the teachers. 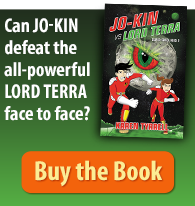 I write humorous techno sci-fi fantasy novels for kids and hope to publish this series soon. Am I qualified to teach Creative Writing? My name is Karen Tyrrell. 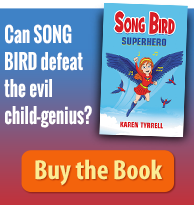 I’m an experienced ‘Gifted & Talented’ teacher and published children’s author; currently I’m a writing tutor for Brisbane City Libraries. 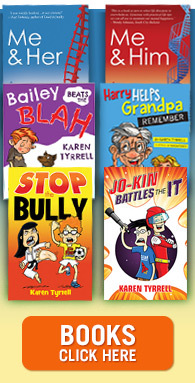 I also present writing workshops in schools, libraries and at festivals. Make sure you have a Blue Card, an ABN number and you know how to write a professional invoice for the school. Talk to the school organizer well in advance so you present a workshop that meets their students’ needs. Ask them to be specific. Work out your lesson plan, your verbal script and practice… practice… practice. Ask your contact person if the school is a “Visible School”. If so, research how to write Learning Goals and Success Criteria. Write these on the white board when you arrive in the classroom. Prepare and print out all the handouts in advance. Plan and prepare visual prompts include posters on laminated cards. Bring blu-tack and anything else you might need. Arrive early to park, to sign on, and set up your room well before students arrive. To ensure there are minimal behavior problems, make sure a teacher is present. Keep the lesson FUN, moving along at a good pace and very positive. Don’t respond to calling out or rude behavior. Email the school suggested follow up activities for the children to complete afterwards. Send the school your book information as well as info on other workshops and talks you present. Show the school Library / Resource Centre your books and publications. They may order your books as well. What was the BEST thing about presenting Creative Writing? YAY! A testimonial from Mabel Park SHS has arrived!! ‘Thanks so much for bringing your talents to Mabel Park SHS for our Year 9s. I admit I was a little anxious embarking on creative writing activities for some of the low-achievers, but delighted when I saw the result. I LOVED watching how engrossed the children were with their stories and how much they wanted to keep writing when the lesson was over. Have you ever considered teaching Creative writing to schools and libraries? Were the workshops tips helpful to you? Please share to your networks, LIKE, tweet and Google plus!! Thanks Steve, for being my #1 supporter and motivator. GREAT tips Karen. Thanks for sharing. I agree with Steve–these visits are gold. As a child I would have loved to attend a workshop like yours. I have presented workshops in the classroom years ago. It’s really important to be super organised & practice. Wonderful work Karen, you are an inspiration. Thanks Ali, for checking out my tips and adding them to your board at Pintrest. Really appreciate you coming over to check out my tips. Thanks so much for bringing your talents to Mabel Park SHS for our Year 9s. I admit I was a little anxious embarking on creative writing activities for some of the low-achievers, but delighted when I saw the result. Your motivating, inclusive style and high-yield activities really had the students at all abilities working hard, creating stories and experimenting with their imagination. Congratulations. I’m sure the students can now approach creative and imaginative written tasks with a sense of confidence and achievement.